Moodless, Try as I might, I simply cannot find out how to send a PM! Color me dense! left click on my name/avatar then a few pop-up options would show, the top one is "send a pm to______" clikc that one and it would direct you to your messages/inbox..
Hmmm..... this is very strange. When I LEFT click on your name, I get the drop-down menu, but there is NO option so send a PM! When I click on anyone else's name, even my own, the option is there! Odd, that! Maybe, if you wouldn't mind, PM ME and I'll reply with my mailing address. Sorry for all the trouble. i just realized i already turned off pms way back in 2015. was active here then till i noticed some of my post have been deleted by sensitive people, hence my inactivity from this forum.. 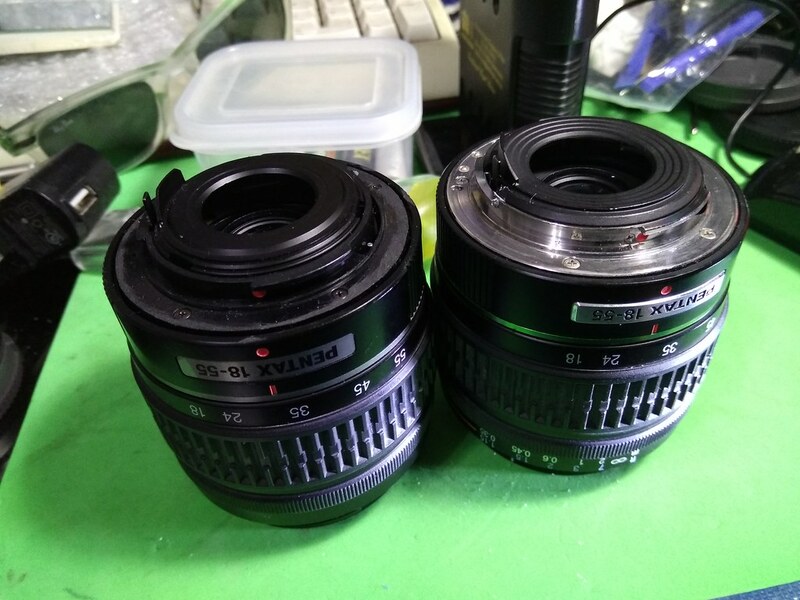 Above photo of both DAL 18-55 on the left and the DA 18-55 on the right (with the metal mount.) this was shot before i mailed you the plastic baffle on the right last week. The DAL is just a spare which i often use on the modded full spectrum Oly EPL-2 since the lens dont have any hot spot in the center. the DAL rear plastic baffle is clip-on type while on the metal mount DA, the plastic rear baffle is screwed onto the metal mount. I received in the mail today, the Pentax 18-55mm dust bezel I was looking for. One of our generous, kind members (Moodless) took the time to package it up and send it all the way from Singapore to Idaho, USA! I'm very grateful that he would take time out of his busy day to do this favor for me. The part fit like a glove, the lens looks like new and now, I'm a happy camper! Thanks again, Allan. Your generosity and kindness speaks a great deal about your character. oh, that was fast.. took only 2 weeks? the postal machine where i bought the postage/stamp indicated to me it would take 4-6 weeks for the mail to arrive in your location. Well, happy to be of help since i never use that rear lens bezel anyway. i even had an old plastic bezel that was lying around from an old pentax 28-70 that also fit the 18-55 kit so rather than mispalcing it again, i temporarily put it in the back of the other 18-55 kit.